Start your visit to Dublin with coffee at Clement and Pekoe or Kaph. If you are traveling with a tea drinker, Clement and Pekoe is your top choice. Clement and Pekoe offers a wide selection of loose leaf teas in addition to coffee from a variety of Dublin-based roasters. Accompany your hot beverage with a sweet treat and either eat inside in the cozy, relaxed interior or sit on a bench outside and watch the hustle of people moving along South William Street. Kaph has put their shingle out on Clarendon Street and serves a well-crafted cappuccino. Drink your coffee with an almond croissant. You'll find artist and exhibit space upstairs; two reasons to give Kaph a try. No trip to Dublin is complete without a pilgrimage to the statue of Molly Malone which is currently located across from O'Neill's pub at the corner of Suffolk St. and St. Andrew's Street. 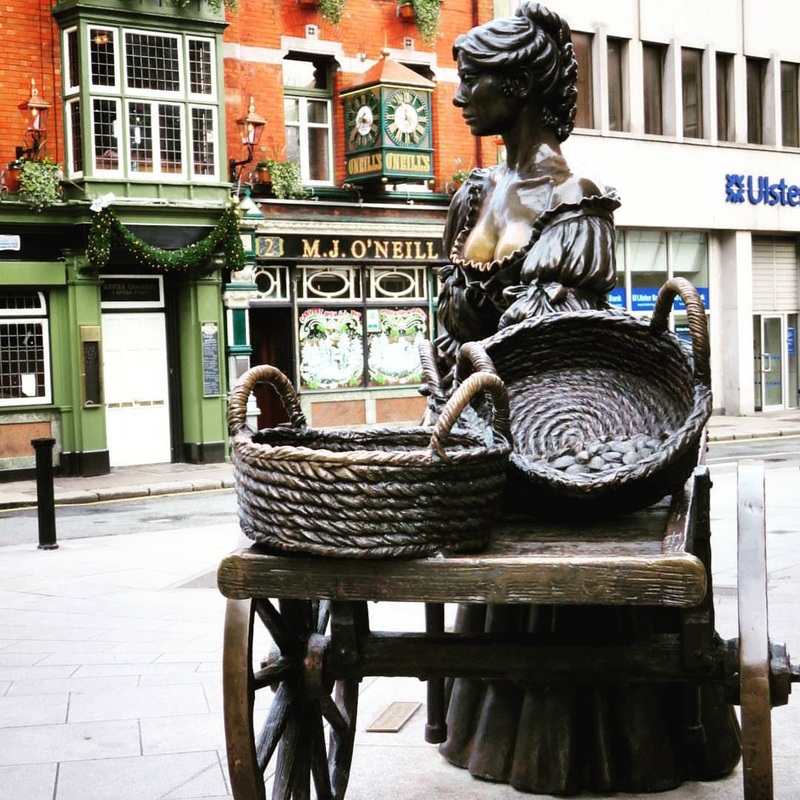 Molly, a fictional fishmonger ("crying cockles and mussels"...), has a famous song written about her which is a kind of unofficial anthem for Dublin City. Many believe that if you rub the statue it will bring you good luck. It seems that a number of folks have gotten pretty grabby since the area around her bust is discolored from the hands of tourists. Let's keep it clean, folks! Next up, visit George's Street Arcade. George's Street Arcade is Dublin's first shopping center built in 1881. You'll find classic Victorian accents surrounding funky thrift stores, craft stalls, and casual eateries. Powerscourt Townhouse is another unique shopping centre in the heart of Dublin. Powerscourt is a historic Georgian building that has been transformed into a boutique shopping mall (after a stint as a parking lot! What were Dublin's city planners thinking?) Take some time to browse and steep in the atmosphere. Head over to Dublin Castle and the Chester Beatty Library. If you're hungry, enjoy a delicious casual lunch at the Silk Road Cafe. Silk Road Cafe serves some of the best Middle Eastern food in Dublin. Take some time after lunch to pore over the ancient religious texts in the collections at the Chester Beatty Library Museum. The exhibits are fascinating and best of all, the Chester Beatty Library is free to visit. 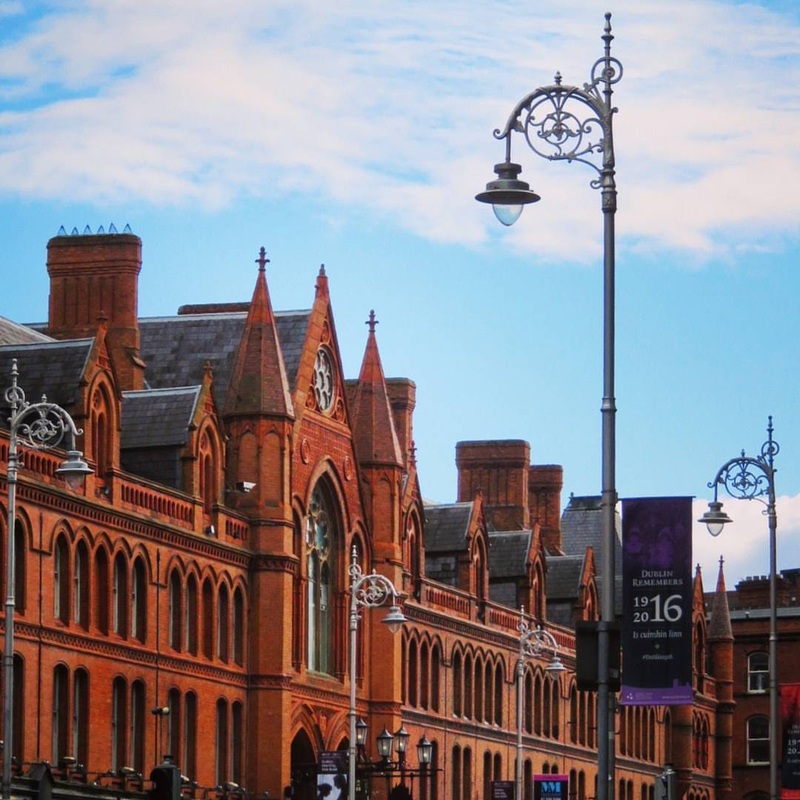 After lunch, spend the afternoon in another of Dublin's historic buildings. Catch a movie at the Irish Film Institute (IFI) which is situated inside a former Georgian townhome. You'll find some mainstream and a lot of Indie films at the IFI. On this one occasion, forego the pub and grab an evening coffee at Accents. Accents is open late and is a great alternative for people visiting Dublin who don't drink. Sit on a comfy couch on the main level or downstairs and sip a hot beverage and maybe a generous slice of cake. For dinner, you have a few choices in the neighborhood. Sample Moroccan cuisine at Dada. 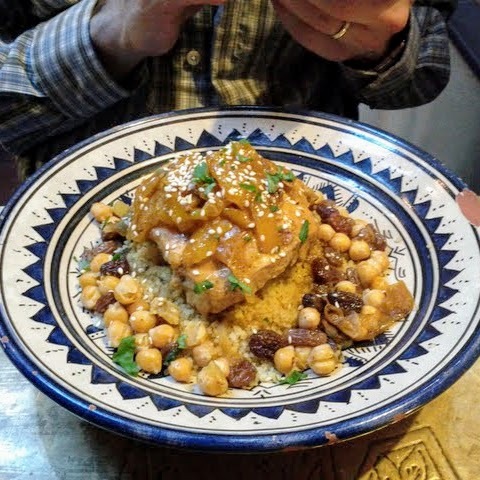 The tagines are fantastic: my meal was spicy, sweet, and aromatic all at once. If you're not as hungry, stop in for tapas at Market Bar. The venue is large, open, and generally buzzing. 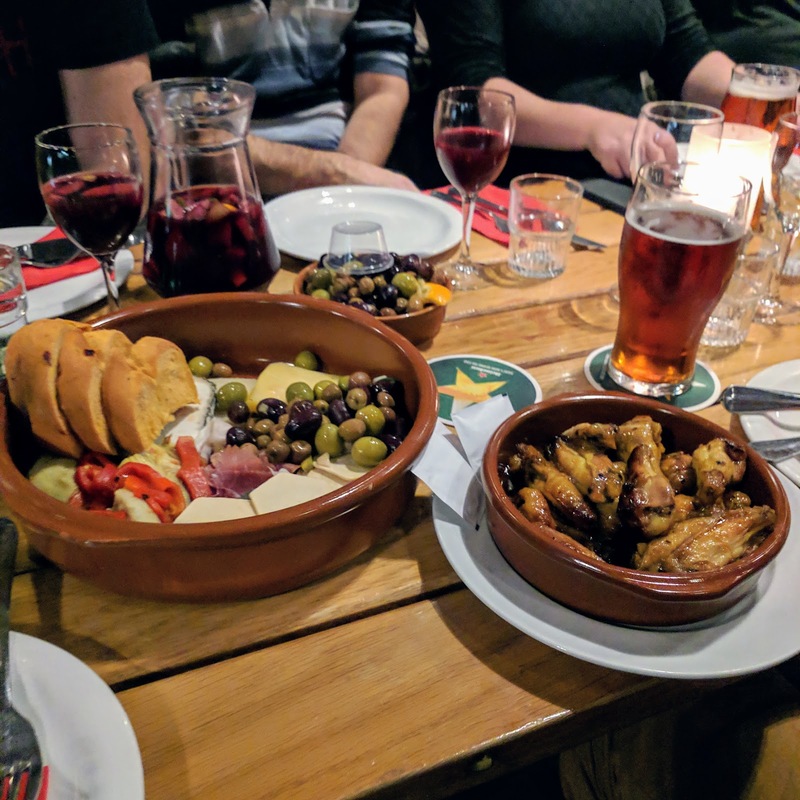 Order a few small plates to share with a pitcher of sangria. If you prefer, go in for a celebrity chef experience at Fade Street Social by Dylan McGrath. The menu features homegrown produce and fresh simple flavors. Fade Street Social also has some fantastic cocktails. Since you skipped the pub earlier, that means you can have a nightcap glass of wine at one of Dublin's wine bars. Olesya's - Olesya's is a cozy wine bar with comfy chairs to sink into and sumptuous artwork and decorations on the walls. Peer into the mirrors to see what was happening around the venue. The wine menu is extensive. Olesya's also serves dessert. Perhaps indulge your sweet tooth with some Siberian ice cream. It's always a good idea to end a sweet evening on a sweet note. Fallon and Byrne - Fallon and Byrne is a high-end grocery store in Dublin with a restaurant upstairs and a wine cellar downstairs. If you are in the mood for something sweet, make your selection from the extensive bakery in the market and bring it downstairs with you. Fallon and Byrne's wine cellar is all dark wood with bottles of wine for sales along the walls and bright posters decorating the columns in the space. Drink your glass of wine while perched in front of a wine barrel that doubles as a table. Fallon and Byrne Wine Cellar has fantastic atmosphere. La Cave - Located just off of Grafton Street, La Cave is all about cluttered French ambiance. Sit down at the bar and enjoy a small carafe of fine French wine. If you're still hungry, you can also get some small bites to eat. We sampled crusty bread and butter, a goats' cheese salad and crab meat tartlet to round out the experience. If you only have room for dessert after dinner, try the simple chocolate mousse. 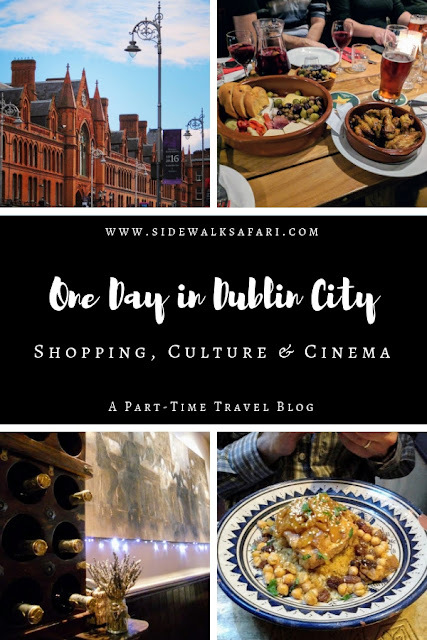 Explore a one day Dublin City itinerary focused on shopping, culture, and cinema. 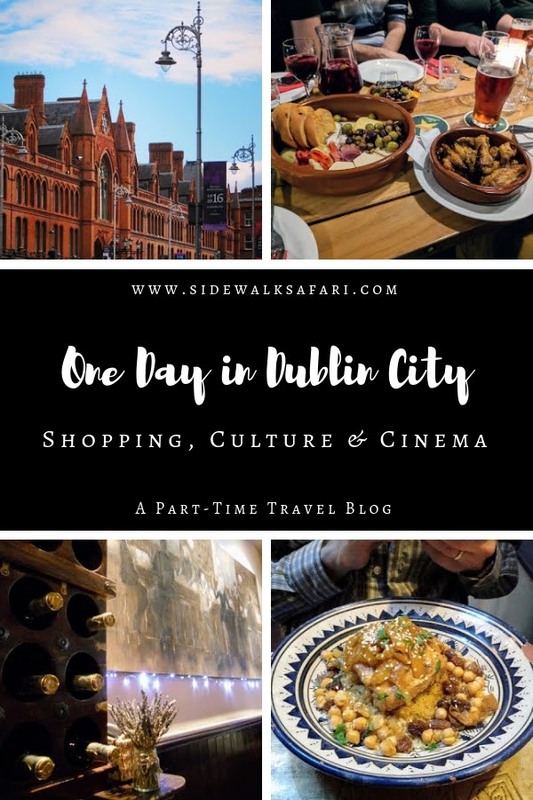 Shop at George's Arcade and Powerscourt Townhouse. Visit the ancient religious texts at Chester Beatty Library and catch a movie at the Irish Film Institute (IFI).